On January 10 Kyrgyz mass media published the report on the work of Ombudsman in 2010, presented to the parliament of the republic. The document also mentioned the commission, established by the Ombudsman Tursunbek Akun for investigation of June riots’ reasons in the south of the republic. It turned out the commission believes that "south of Kyrgyzstan faced local conflict, initiated by ethnic Uzbeks, such as K. Batyrov, I. Rasulov, J. Salakhutdinov, K. Abdullaeva. They started this conflict, financed and instigated common Uzbek farmer to go against Kyrgyz, while Kyrgyz finished it". In the opinion of the commission, the goal of the provokers was to "turn Uzbek into official language and make Osh and Jalal-Abad oblasts the autonomous regions of Uzbekistan". "They were linked to Uzbek citizens, rich Uzbek people that stand against Islam Karimov. They wanted to overthrow Karimov and elect their own candidate and rule Uzbekistan with Osh and Jalal-Abad oblasts in it", AKIpress quoted the office of Ombudsman. Having doubts about the statements of this commission, Ferghana editorial office decided to check its opinion with the opinions of prominent experts. We interviewed few experts both in Kyrgyzstan and abroad. Everyone was asked the same question: "Do you have impression that Uzbek separatism, presented by Ombudsman, becomes the official version of the June riots reasons? Are you personally satisfied with this version? Do you believe in it?" 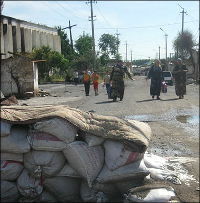 - The Osh riots were mainly chaotic that does not exclude the possibility of provocations both from Uzbek and Kyrgyz sides – said independent Moscow-based journalist Orkhan Jemal. Undoubtedly, "the trigger" of the ethnic conflict was the attempts of Uzbek community leaders to gain more rights for ethnic Uzbeks. On the other hand, while in Kyrgyzstan I have not seen the evidences on how Kadyrzhan Batyrov was going to separate Osh and Jalal-Abad oblasts from Kyrgyzstan and attach them as autonomous regions to Uzbekistan. Perhaps, there were Uzbek leaders that joined anti-Karimov movement, but this factor did not play any role in the summer of 2010 in south Kyrgyzstan. Looking to solve their political tasks, the Uzbek community leaders wanted to gain the support of new government (northern Kyrgyz that replaced Kurmanbek Bakiev) and were involved in the conflict with southern Kyrgyz. The tensions turned into pogroms primarily because of widely popular nationalistic and anti-Uzbek mood among Kyrgyz that viewed Uzbeks as alien community (although Uzbeks have been historically living in this region). The law enforcement structures, criminals and volunteer Kyrgyz joined the pogroms in Uzbek residential areas. In my opinion, the current interpretation of the events (Uzbek separates sparked the conflict) is the attempt to place the responsibility to the Uzbek community leaders. However, I believe the biggest mistake was made by those northern leaders that allowed poorly organized and weakly controlled civilians of non-titular nation to go to the streets with the purpose of solving their own tasks. The southern politicians allowed the worst scenario of interethnic massacre that hit their northern opponents, demonstrating that new government is not able to control the situation. Generally speaking, all Kyrgyz politicians of the recent period are partially responsible for the tragedy because in the last years they have been stimulating Kyrgyz nationalism. This violated the rights of Uzbek minority, generating the conflict situation. We recently learned that National commission for investigation of June riots "put the main blame on Kadyrzhan Batyrov and his few supporters". However, the commission head Abdygany Erkebaev also believes that "Bakiev’s clan played important role in the events". According to Mr. Erkebaev, "the clan representatives agreed with the members of criminal and terrorist groups". Commenting on the actions of Kadyrzhan Batyrov prior to Osh riots, Abdygany Erkebaev said: "He traveled through the southern regions of Kyrgyzstan and organized over 25 meetings that put various requirements; however, none of the Uzbek community leaders officially claimed autonomy". Until the government approves the conclusion of another commission (established by Ombudsman) we may not say Uzbek separatism, as the main reason of Osh riots, is official. I am personally not convinced with such conclusion. traumatized, not about separatism. Both Kyrgyz and Uzbeks in the South are in need of help on the road to reconciliation, the last thing they need is further conspiracy theories. - I see no reasons to talk about "Uzbek separatism" in Kyrgyzstan – said Sergey Abashin, Doctor of History, research fellow at Russian Academy of Sciences institute of ethnology and anthropology. – The demand to grant higher status for Uzbek languages and make the authorities more representative from ethnic point of view are very normal for every democratic state, signing basic UN and OSCE documents on human rights. Even assuming there were radical statements they cannot justify violence against Uzbek minority, their discrimination and violation of rights. The attempt "to explain" the June riots by "Uzbek separatism" shows that current government in Kyrgyzstan cannot take the responsibility. - Major reason of June riots is the absence of influential people in Kyrgyzstan – said Torgny Hinnemo, the independent journalist and regional expert from Sweden. – There are too many officials that tried to deny this fact with the help of conspiracy theories. Nonetheless, if Kyrgyzstan was a strong state it could struggle with the criminals. Today, Kyrgyzstan needs dialogue between Kyrgyz and Uzbeks. - I view the conclusion, presented by Kyrgyz Ombudsman, on the version of June pogroms as absurd – said Sanobar Shermatova, the journalist and RIA Novosti expert council member. – What does it have to deal with overthrowing Karimov’s regime in Uzbekistan? Do they really believe it could be possible to do on June 11-12 when Islam Karimov was hosting the Shanghai Cooperation Organization summit in Tashkent? One has to admit that it is difficult to follow the logic of authors of investigation. In reality there is no mythical separatism and mysterious conspirators. Everything is much simpler. Generally speaking, this is not a secret. At the end of December, answering the Azattyk question on the reasons of bloodshed, President Roza Otunbaeva admitted that "people from law enforcement structures" were managing criminals. - I believe the current government of Kyrgyzstan would be satisfied with this conclusion – said Alexander Knyazev, the professor and regional expert, living in Almaty. – It is much simpler to justify the crisis condition of the republic by the separatism. I am interested to see Tashkent’s reaction on links with "Uzbek citizens, rich Uzbek people that stand against Islam Karimov". Some time ago the evaluation of national commission for investigation of June riots, the start of its work and first public evaluation of Mr. Erkebaev became the reason why I left the commission. In my opinion, the Ombudsman’s commission is not worth paying attention. I cannot either trust or be satisfied with its evaluation. It can be considered as one of the elements of Bacchanalia, launched by Kyrgyz politicians. - It is very sad that up until now neither State commission for investigation of June riots nor Ombudsman have investigated the facts about riots. Very unsound versions and conclusions – emphasizes Dinara Oshurakhunova, the head of Coalition for Democracy and civil society (Bishkek). – The Ombudsman must show the facts of violation of human rights, but we see the political report. The state bodies must produce unbiased documents, but we see politics in action. I would want to see what government did in order to prevent the conflict in the past and the future. I am very skeptical about such documents; I am not satisfied with them. - When public people say such things they add weight to what was mentioned before; they become the official version, influence minds – noted Nurbek Toktakunov, Bishkek-based lawyer and the Director of Precedent public association. Generally speaking, this is not his (Ombudsman’s – editorial note) problem. It is the law enforcement structure to find guilty. I my opinion, the Bakiev’s clan, criminals and Uzbek political leaders were involved in the conflict; therefore, there are versions of separatism. However, our law enforcement bodies could not present vivid evidences of these versions at the appropriate level. We need to reveal the system, sources of financing and we need to track financial flows. Do I agree with the version of Mr. Akun? There is presumption of innocence, I need to endorse. I have certain ideas because I travelled intensively through the south. I have a reason to suspect it was certain political leaders that influenced people. - First of all, I am impressed by the primitivism of conclusions, highlighted in the report of Kyrgyz Ombudsman – said Arkady Dubnov, the expert on Central Asia and observer of Moskovskie novosti newspaper. – Is not it the reason why the name of Ombudsman Tursunbek Akun is not mentioned in the report? Such definitions as "rich Uzbek people that stand against Karimov" remind the textbook of History for 5th grade in the rural village. "…Uzbek farmer to go against Kyrgyz, while Kyrgyz finished it". The conflict, we should understand? If so, Kyrgyz "finished" it successfully. According to the report of national commission for investigation of interethnic clashes in south Kyrgyzstan, dated January 11, there were 276 murdered Uzbeks and 105 killed Kyrgyz. Further on, the report says "the goal of provokers was to grant official status to Uzbek language, turn Osh and Jalal-Abad oblasts into autonomous regions of Uzbekistan", "overthrow Karimov", "rule Uzbekistan". If this "analysis" is made by the office of Kyrgyz Ombudsman, we need to admit that state-guaranteed protection of human rights in this country deserves better piece. On the other hand, it was necessary to thank Tashkent for offered discount ($19) on Uzbek gas, supplied to Kyrgyzstan: instead of $242 per thousand cubic meters, Bishkek was paying in 2010, the price for 2011 is $223. - Kyrgyzstan is not lucky with the persons that perform as the supreme state human rights defendants (i.e. Ombudsmen) – said Azhdar Kurtov, the chief editor of Problems of national strategy magazine under Russian institute for strategic research. – All over the world (except for few countries) this position is taken by those who really defend the rights, but not elements of complex governmental mechanism. For some reason Kyrgyz Ombudsmen are involved not in the rights activities, but public politics. First, they are inclined to make big statements and actions. Secondly, Kyrgyz Ombudsmen protect not people, suffering from the government, but the government itself. The human rights advocates must be guided by the supreme sense of the right, looking for justice, but not become the lawyer of those, violating rights. The conclusions, made by the commission (established by Kyrgyz Ombudsman), on the reasons of June massacre are not convincing. Where are the evidences? The lawyers are motivated not by slogans and assumption, but evidences. The opinions and even appeals to grant Uzbek languages the status of official language in Kyrgyzstan – is not crime yet and not the evidence for separating Osh and Jalal-Abad to the benefit of Uzbekistan. Uzbek minority in Kyrgyzstan never had appropriate representation in power, therefore, lacking administrative resource and representation in security structures. The power during Akaev’s, Bakiev’s and Otunbaeva’s rule belonged to Kyrgyz that must bear the responsibility for the events in the republic. Hence, even if Kyrgyz Ombudsman is not willing to admit mistakes, made by the government, Kyrgyz society is sick with nationalism while Kyrgyz state does not understand its own mission.